Around the Bay 30K will always be a favorite race of mine. It’s not the town, the distance or the time of year, but a 22 year old memory of meeting my husband at this race and running (and talking) the course with him. Yup, one of us got picked up at the start line of Around the Bay. This year, while I’d have rather been running the 30K, Coach Kevin didn’t want me to race the distance so close to a spring marathon; he did, though, say that we could work the 5K into my training. So, this morning, Dave and I returned to Hamilton to run the 5K event. Even though we were both running, our goals were different. Dave was there for the race atmosphere, for a chance to better his time. Me? I wore my competitive hat to the start line. I had a time goal and I wanted to be a top finisher. My training partners from Oakville were also running, and my coach and other club coaches were cheering us on. This race was important to me. When Miss Monica, Kelly-Lynne and I got to Hamilton, we did what most female runners do: warmed up and headed straight for the bathrooms. Copps Coliseum and its “facilities” were open but the line-ups were huge. Kelly-Lynne and I went back outside to find the porta-potties, thinking those lines would be shorter. Even though, there were more than 7500 runners, there were only five porta-potties. You would think that with all of those race registration fees, the organizers could spring for one or two more! Well, we waited, and I ran up and down the streets trying to keep warm while Kelly-Lynne held our spot. We made it in and out with 15 minutes to spare, finished warming up, passed our gear onto Coach Kevin and toed the line. There were just over 2 000 people running the 5K. The three of us jumped in as close to the front as we could and were surrounded by young runners – high school, varsity, even a lot of junior grade kids. I was squished and was certain that I would either be pushed by one of them or trip over another. When the gun went off, then, I bolted; I wanted to get away from the crowd as quickly as I could. I went through the first kilometre in 3:55. “Too fast,” I thought. Yes, the start was downhill and I felt good, but I worried that I wouldn’t have anything to run back up towards the finish so I pulled back. Looking back, I realize that I probably shouldn’t have – something to remember for the next time. 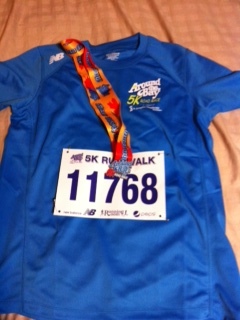 I went through 2K in 8:10, which was much better, and found my pack to run with – two other ponytailed runners. Coach Kevin has been helping me turn over my legs to surge in racing and I did that twice today. Each time, I did pull away from other women and, each time, I felt I was able to get right back to my race pace without being exhausted. I think I needed to surge longer, though, or add one more towards the end as the two girls stayed with me each time. The last kilometre was incredible. There were lots of spectators to cheer us in. Once on the main street, we turned towards Copps Coliseum, ran down its ramp and into the stadium, where we heard our names announced. I felt quite elite racing down one of the three lanes towards the finish line. My clock time was 21:13, which was a bit disappointing as I was hoping to run under 21 minutes. However, this was my first 5K since last August. I know I didn’t push myself hard enough; it just didn’t hurt the way it should have. Congrats Cynthia! You always amaze me with your running and while I know you were disappointed with your time, I am so proud of you!